The list below represents many of the data sources and types of data tracked for the research outputs noted. For some sources, only one type of research output is tracked; for others, several may be counted. Not all altmetrics sources or aggregators use the same terminology for their measures, count the same metrics, or count the metrics in the same manner, frequency, or with the same methods. Some may employ weighted measures too for some metrics. Thus it is not statistically correct to compare altmetrics scores across aggregators or social media. The following list includes overlap to familiarize you with the terms that altmetrics aggregators use and report to you. Usage: Can include clicks on your works, downloads of the article, views, library holdings, or plays of a video. Readership: Can include number of views, saves, downloads, comments, or scholarly (or popular) mentions (sometimes called buzz) on publisher sites or other integrated sites. Captures: A term that counts a bookmark to your article. Reference managers: Number of “saves” in online reference managers. Mentions: Some measures count blog posts, comments, reviews, and Wikipedia links as a mention. Social networking platforms: Number of links or references to the resource. Number of discussions: Recommendations or copies made of the resource. News outlets: Number of mentions of scholarly articles in magazines and news2 including mainstream media and press releases. Citations: Social media counts citations from non-traditional sources like citation indexes, patent citations, clinical citations, and public policy documents. There are aggregation services that measure how much an author’s works are used within social media. To make better sense of the diverse altmetrics measures, and to save time, authors should use an aggregator service.4 There are currently three main products: Altmetric.com, Impact Story (impactstory.org), and Plum Analytics (plumanalytics.com).5 These services normalize the data for use by individuals, institutions, publishers, funders, and others. Authors can see how they compare to others and can access, see, and share the reports and reuse the data as needed. Not every service measures all social media, and not all services measure in the same way. Not all services are directly accessible via an author registration or individual subscription, which can be confusing. Altmetric.com and Plum Analytics data are licensed by institutions, though the data is available to authors for free via an institution or publisher page. Authors can see their data from these services on their article page from their journal publisher, or an author page, from their institution when they have faculty status, or via a library licensed database like Scopus. Altmetric.com also licenses to publishers or institutions. Impact Story is available to the individual and uses data from Altmetric.com. The service is currently free to authors, supported by the Sloan Foundation, but it may or may not have an annual fee after a free access period. Impact Story uses CrossRef for article metadata and ORCID for author identity management. Additionally, there are other services an academic institution may use like the Mendeley Institutional Edition (MIE) that functions as an analytics tool. MIE is built on top of Mendeley, so an academic institution can understand its research output4 and impact. *Note: This listing is not all inclusive and does include or describe all the metrics from these aggregators. Not all data that is counted and displayed may actually be used in the aggregator’s altmetrics score. Not all metrics may be counting the same items, or counting in the same way. Check the aggregator’s websites for details. A Lippincott, Williams & Wilkins (LWW) survey reported that authors used social media to help identify areas of interesting research and to find fellow researchers worth noting.10 So this data supports the current awareness need for authors when interacting with social media. Altmetrics has other uses, too, such as identifying collaborators and providing deeper insight into your research impact for your CV, for tenure or promotion applications, or grant proposals—to name a few. Support a grant funding proposal with impact data your team can efficiently find and use: Some funders have criteria that include documenting broader societal impacts from your research.4 And sometimes your works allows no time to track that impact! So now that you are convinced altmetrics can help you and you want to get started, where do you begin? The following list of techniques and tips provide a simple plan. It is important to maintain and manage any and all online presences you create.4 Don’t start and then stop. Your social media and altmetrics success depends on discipline regarding4 best practices and feedback loops. The latter can be your own observations and preferences after learning more about a tool, as well as input from colleagues. Choose one or two primary platforms4 and choose carefully. If your colleagues do not use Facebook, consider another. Some institutions limit access to social media, so don’t choose one if you need access during your workday and it is blocked. If a tool seems too complex or time consuming for you, start with an easier one.16 Perhaps choose one that your institution includes in a workshop, or one that is popular with your discipline. Including Twitter at the start is generally easy and often used by authors in medicine and the life sciences. Choose an altmetrics aggregation service, perhaps one offered by your institution, to discover and track altmetrics of your works. Or get started with a free one mentioned in this article. Read the terms of service and create an account/profile with each tool and/or platform you choose to use. Keep track of your logins and passwords! Invite colleagues to link, follow, join, bookmark, etc. your presence. Spend a week or two reading and watching what other researchers do with social media to promote their works. Watch when and how they promote their works—learn by observation. Actually use the tools for current awareness, regularly monitoring scientific social networks4 you select and explore platforms that may link to your research. Get and use the free Altmetric Bookmarklet from Altmetric.com to instantly view the altmetrics of a paper. It has drag-and-drop installation for Chrome, Firefox, and Safari and lets you see the online shares and mentions of the article with a single click from within your web browser. Get your feet wet by using one tool to accurately attribute your research4 and promote one work. Use the DOI when possible, and remember the current awareness rule. Why should someone pay attention to your authored research object and use that in your post or other initial use of social media? 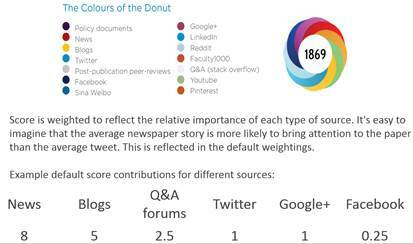 Monitor the altmetrics impact to your post in your social media aggregation tool. Did anyone retweet, mention, link, blog, or otherwise notice your authorship? Promote your works based on your observations and altmetrics data. Does a catchy headline gets more retweets, or is it a topic? Does your presence get more attention after significant sharing of the work of others? What else can you test? Reflect and plan. Maybe you have used social media for many months or years and know the steps outlined here. Do you have a plan for using the tools to promote your research? If you are serious about accruing altmetrics for your professional profile, creating and using a plan can make all the difference. Ask yourself, what could you do with these tools? What do you want to achieve? How can social media and altmetrics help you with any of that? Write down your own “manifesto” and a simple manageable plan. Integrate it into your work-life and be sure you note how often you will check your social media and altmetrics data. Keep a copy of it on your desktop and revisit it regularly and revise it at least annually. Do you separate your personal and professional online personas? It’s a matter of personal preference and some authors do, some do not. Do you need two accounts on any one tool for that purpose? Should you post separately to family and friends, from your professional colleagues? Do you have time to separate out public posts from private ones, and does the tool allow that? Stop and consider the impact of intermingled information over the long term and if there are any significant negative possibilities. Alternatively, consider using one tool for only personal social interactions and another tool for professional purposes. What makes sense for you? Some online content never dies. Never tweet, blog or use social media on any platform for anything you may someday want to forget or could regret later. The Internet can be unforgiving, and deleted information may continue to live online in archives, news sites, or the WayBack machine. There are some countries with regulations in this regard, generically called the right to be forgotten, but are the exception. Remember, you can’t control the message. After your message is sent externally, it generally can’t be recalled if unread. Where your message is forwarded, the comments or reactions to your message, or even who reads it, are all out of your control. A message about your research often finds its own path. The best way to create influence and attention for your profile as an author is to show up, help colleagues, and honestly and authentically participate with the individuals in your social media/networks. Be humble.16 Sure your work may be the best, but let others say that—it goes further. Be careful of language. Don’t complain about anything or anyone or use words that may be sensitive to people, especially when promoting your work, even if it gets attention. What is inappropriate in the workplace is the same online. Don’t use negative commentary when responding to negative commentary by others. Turn it around if possible. Author disambiguation. Is your data mixed in with someone else? If so, contact the altmetric aggregator. Lack of altmetrics data comparisons between disciplines can lead to skewed comparisons. All altmetrics data should NOT be treated equally. Be wary of dashboards comparing schools or departments, or across different altmetrics aggregators. One discipline may use Twitter, another may prefer Mendeley. Visit the website of the library or your alma mater to learn more. Most medical, nursing and allied health schools have guides on this topic and use keywords like altmetrics or scholarship to locate their LibGuide. Many libraries also list reputable social media or scholarly sharing sites specifically for medical disciplines for example see the website of Weill Cornell Medicine, Samuel J. Wood Library, aptly named SCISSORS - Scholarly Communication Information Services in Support of Research. Collister, Lauren B. and Timothy S. Deliyannides. “Altmetrics: Documenting the Story of Research.” Against the Grain, February 2016, pp 16-18. Costas, R., Zahedi, Z., & Wouters, P. (2014). Do altmetrics correlate with citations? Extensive comparison of altmetric indicators with citations from a multidisciplinary perspective. arXiv preprint arXiv:1401.4321. “Altmetrics,” Online Searcher. March-April 2015. Vol. 39(2):6. Galloway, Linda M. “Introduction to Altmetrics for Medical and Special Librarians,” National Network/Libraries of Medicine - Middle Atlantic Region (NN/LM MAR) Boost Box Series. March 2014. Kwok, R. “Research impact: Altmetrics make their mark” Nature, 500, pp. 491–493 (22 August 2013) doi:10.1038/nj7463-491a Published online 21 August 2013. Scheponik, Nick, Amirah Lawson, Tom Pacific. “Altmetrics: Becoming More Than Just a Buzz Word,” [Unpublished]. Poster at the Lippincott Williams and Wilkins Symposium, 2014. Kaplan, Andreas M. and Michael Haenlein. “Users of the world, unite! The challenges and opportunities of Social Media,” Business Horizons (2010) 53, 59—68. doi:10.1016/j.bushor.2009.09.00310.